Loosely translated, a LU‘AU is a big FEAST with a lot of singing, dancing and festivities. Backyard lu‘au have been part of the Hawaiian culture for centuries and are ingrained with the Makahiki festival, a time of great celebration marking the start of the harvest season and New Year in ancient times. Today, commercial lu‘au have developed with the tourist trade and are major resort attractions. Lu‘au ENTERTAINMENT is almost always homegrown and showcases the considerable performance skills of hundreds of singers, dancers and more. Dinner also is a prime exhibition of the islands’ best, with a traditional main course of kalua pig that’s slow-roasted all day in an imu (underground oven), then unearthed with a flourish just before the meal. and honey-roasted Moloka‘i sweet potato and roasted coconut. Lu‘au are open to the public and presented daily at a variety of locations on O‘ahu. GERMAINE’S LUAU is among those that allow you to experience the rich heritage of the Pacific Islands, but there are many others around O‘ahu that will fill your belly and entertain you. 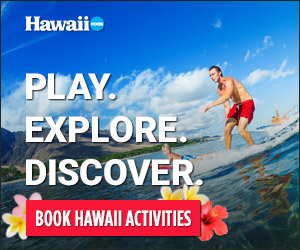 Options include: HILTON HAWAIIAN VILLAGE’S STARLIGHT LUAU in Waikiki; DISCOVER HAWAII TOURS’ new BIG KAHUNA LUAU held at the historic Honolulu Ridge Estate on top of Tantalus, a hilltop drive in Honolulu; DIAMOND HEAD LUAU (diamondheadbeachluau.com), featured by ALOHA HAWAII TOURS; A ROYAL HAWAIIAN LU‘AU, ‘AHA‘AINA and TE MOANA NUI at Sheraton Princess Kaiulani (princess-kaiulani.com/show/te-moana-nui), in Waikiki; as well as KA WA‘A AT AULANI and PARADISE COVE tucked away on the west side.